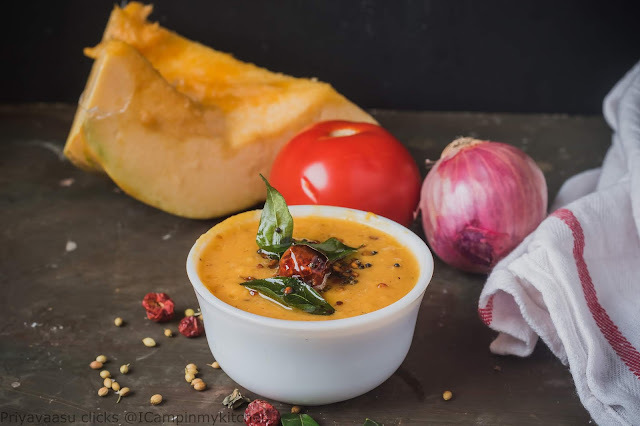 Pumpkin chutney, this is one recipe, that got all attention in my page, even before i shared the recipe here in the blog. When i was sharing my breakfast stories in instagram, i shared this pumpkin chutney which i packed for my kids breakfast box. Many of my followers and friends asked for the recipe, who tried it and gave me positive comments. So, when i chose the theme Kids delight - Veggies sneaked in, i decided to post this recipe too. This is a delicious chutney made with pumpkin, along with coconut and coriander seeds. Do not miss coriander seeds in the recipe, as they add nice aroma and taste to the chutney. Sending this to Kids Delight - Veggies sneaked in, happening @ Vidhya's kitchen, an event bysrivalli. Roughly chop the onions and tomatoes. Peel the hard skin of the pumpkin and chop it roughly. The measurement above, is after peeling the skin. In a pan, heat 1 tsp oil, when it is hot, add onions, curry leaves, hing and red chilies and saute until translucent. Next add the tomatoes and chopped pumpkin, add coconut and 1/2 cup of water. Cover and cook until the pumpkin is soft. Once done, take it off the stove, let it cool. Take all the veggies along with salt in a mixie and grind until smooth. No need to add water, as the water in the veggies is enough to process it smooth. Transfer the chutney to a serving bowl. Now heat oil given under tempering, splutter mustard seeds, add red chili and curry leaves. 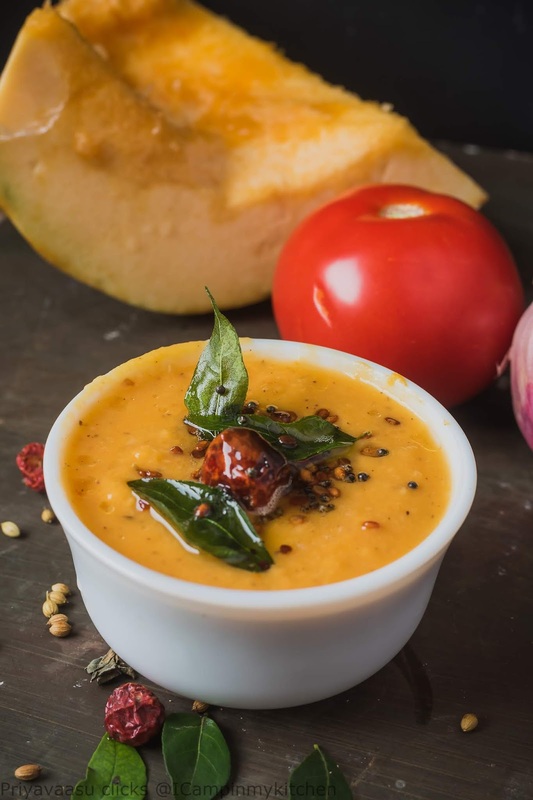 finally add urad dal, let it turn golden brown, pour the sizzling tadka over the chutney and serve it along with idly/dosa. The heading piqued my interest as well. Never heard of a chutney and sounds really delicious. Wonderful chutney with a fabulous colour. Quite an interesting addition of pumpkin here. Prefect side dish for some crispy dosas. what a beautiful color to the chutney, Priya. Would love to make this chutney. I love vegetables based chutney. This so good given that pumpkin are in season now. So yummm and good. Very innovative chutney recipe with pumpkin. The pumpkin would add a nice sweetness to the final dish. Wow chutney with pumpkin sounds sooo perfect for this time of the year. Love that beautiful color. pumpkin is one of my favorite things in the world and I LOVE the idea of this chutney! I dont use pumpkin much on my cooking. But the chutney is tempting me to try this dish soon. Looks delicious. 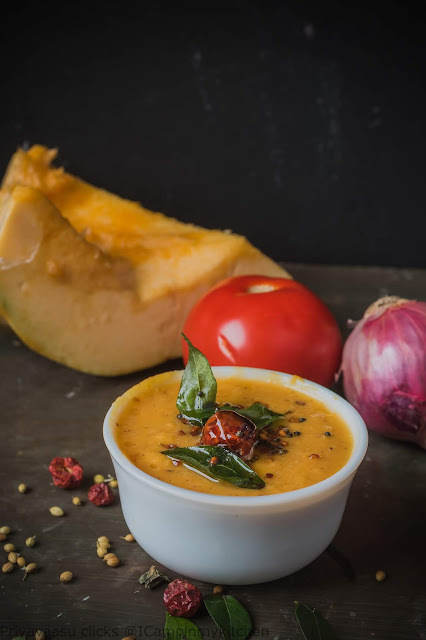 We love pumpkin in our house and I am so excited to see this chutney recipe. I will definitely try this soon. Looks so delicious! This is super cool Priya, I might try this one sneaked for the big boy at home..hehehehe...very lovely colour!